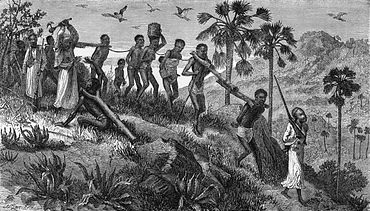 The Atlantic slave trade began during the 15th century and continued through the 19th Century during which period it was eventually abolished. The triangular trade was born out of the desire for European empires to establish themselves via trade in the New World. European and American settlers enslaved West African civilians and subjected them to gross abuse and neglect to fulfil their increasing labour needs on plantations. It is estimated that over 60 million Africans died during The Middle Passage, the crossing from Africa to the Americas. the intellectual legitimization attempted on its behalf - the development of an anti-black ideology and its legal organization, the notorious Code Noir. As a commercial and economic enterprise, the slave trade provides a dramatic example of the consequences resulting from particular intersections of history and geography. It involved several regions and continents: Africa, America, the Caribbean, Europe and the Indian Ocean. The transatlantic slave trade is often regarded as the first system of globalization. According to French historian Jean-Michel Deveau the slave trade and consequently slavery, which lasted from the 16th to the 19th century, constitute one of "the greatest tragedies in the history of humanity regarding scale and duration". The transatlantic slave trade was the biggest deportation in history and a determining factor in the world economy of the 18th century. Millions of Africans were torn from their homes, deported to the American continent and sold as slaves. 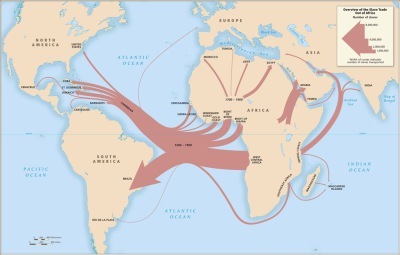 The transatlantic slave trade, often known as the triangular trade, connected the economies of three continents. It is estimated that between 25 to 30 million people, men, women and children, were deported from their homes and sold as slaves in the different slave trading systems. In the transatlantic slave trade alone the estimate of those deported is believed to be approximately 17 million. These figures exclude those who died aboard the ships and in the course of wars and raids connected to the trade. The trade proceeded in three steps. The ships left Western Europe for Africa loaded with goods that were to be exchanged for slaves. Upon their arrival in Africa, the captains traded their merchandise for captive slaves. Weapons and gun powder were the most important commodities but textiles, pearls and other manufactured goods, as well as rum, were also in high demand. The exchange could last from one week to several months. The second step was the crossing of the Atlantic. Africans were transported to America to be sold throughout the continent. The third step connected America to Europe. The slave traders brought back mostly agricultural products, produced by the slaves. The main product was sugar, followed by cotton, coffee, tobacco and rice. The circuit lasted approximately eighteen months. To be able to transport the maximum number of slaves, the ship’s steerage was frequently removed. Spain, Portugal, the Netherlands, England and France, were the main triangular trading countries.